This collection assembles a small sonic universe, combining cinematic, mysterious, wondrous, abstract and ethereal soundscapes – up to 2+ minutes in length – with lush and haunting vocal pad sounds and one-finger-beauties, dark and futuristic drones and some animated sequences with electronic bass, drum and arp sounds using Falcon’s analog and FM oscillators. The samples involved were derived from a broad range of acoustic instruments, electronic sources and field recordings, often using techniques of spectral and additive re-synthesis and/or audio morphing. A bunch of samples was borrowed from the patchpool Iris subscription-library, all other samples were created exclusively for this library. Many presets make use of Falcon’s multi-granular engine and there is also a wavetable synth included. Quite a few presets are running in split mode and/or layer sound textures via key-switches. Up to 20+ Macros and switches plus the modulation wheel are assigned in each patch, many also use aftertouch, providing detailed control over volume envelopes, filtering, amplitude- and pitch modulations, EQ-ing, dynamics, stereo animation, effects and more. All patches use some sort of background image in the UI, split patches have colored key-zones in the Falcon keyboard for easier navigation. 780 MB of samples (53 wavs/stereo/48 Khz/24 Bit) 5 background images for the UI and wavetable re-synthesis. 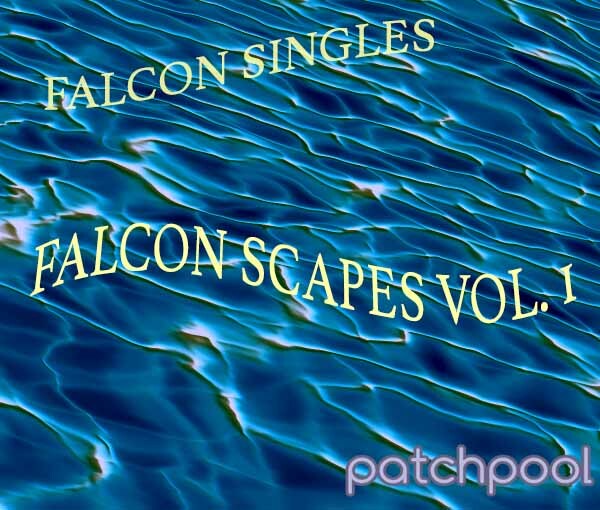 The demos below were produced using only patches from Falcon Singles – Falcon Scapes Vol.1, no post-processing was applied apart from a limiter on the master output.